Remember when you would be woken each morning to the clinking sound of glass bottles as the milky delivered fresh milk to your home? It was a daily ritual that lasted right through my childhood and up until the early 80s. Indeed many milkies even continued to use the old horse and cart for the regular delivery until the early 70s at least. Some people may still recall milk being delivered in a billy which had been put out for the milkman, the milk ladelled out from large milk urns. Perhaps as we get older our memories begin to play tricks on us but somehow I seem to remember that milk back then was creamier, especially if you were the first to remove the silver foil lid and got to pour the fresh milk from the bottle on your corn flakes first. I remember too how my mother used to ‘scald’ milk, heat it up in a saucepan until it formed a skin on top which we then used on bread and jam as a special treat. The dairy industry has always served South Australia well. Up until the Second World War and well beyond, the daily duty for dairy farmers was largely unchanged. Milking was performed twice a day – early morning and late afternoon – either by hand or machine and as the cows were milked, the milk was placed into mainly ten gallon milk cans made from galvanised tin. Photo from the Advertiser. Some people may still recall milk being delivered in a billy which had been put out for the milkman, the milk ladelled out from large milk urns. These cans were placed on wooden platforms along roadsides and were picked up by horse drawn drays or motor trucks and taken to local factories. The cream was placed in churns and sent to factories also. 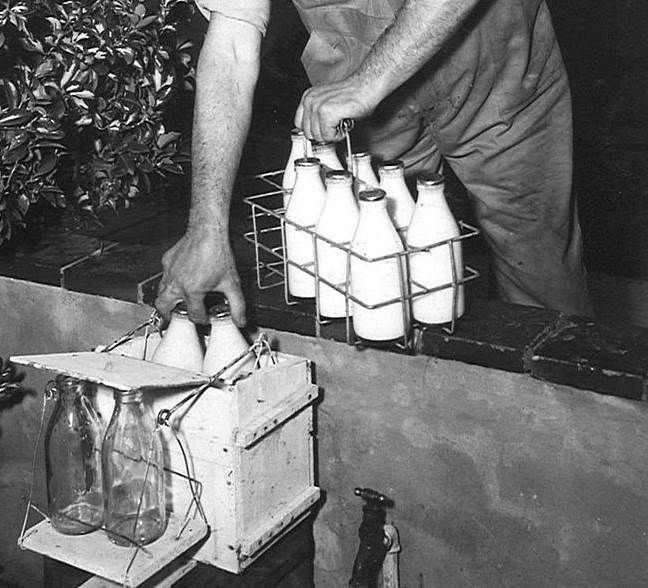 During the Second World War, governments began to regulate the dairy industry in such matters as pricing, health and safety. Dairy and factory hygiene were regarded as extremely important to governments, especially after the war, as the population of urban areas grew rapidly through immigration and a rising birth rate, and people demanded fresh milk daily. The success of co-operatives, such as AMSCOL in Adelaide and Golden North in rural South Australia, led to strong expansion of the overall industry during the 1950s. By this time a range of products, including powdered milk, were sought for export and local consumption. Each Australian state was self-sufficient in dairy products and there was little interstate competition. During the 1950s and 1960s, as South Australian farmers applied new irrigation techniques and introduced better pastures, the industry continued to flourish. By the 1970s most dairy farms had moved to a system of bulk handling for milk and had installed stainless steel vats with refrigeration in their milking sheds in which to store milk. There was also a strong move to promote dairy products and as large supermarkets became the main form of consumer shopping, the daily ritual of milk delivery gradually disappeared from our everyday lives. What are your memories of the milky? 14 Responses to Remember When the Milky Came Every Day? In 1972 as a school child aged 14 I did deliver milk at 11c a pint (glass bottles with the foil cap) in the Plympton area. The milky had a draught horse called Mac who pulled the milk cart through the delivery area. Mac, the horse, knew when to stop and start along the delivery run. A very efficient business. Mac knew the route probably better than we did. After the last delivery Mac would try to race back to the stable for his breakfast. We tried to slow him down because the empty glass bottles threatened to fall out the back of the cart. My dad was a milk man at Keith and people would put a billy out on a hook at their gate or on the door step and wrap the money up in a note saying how much milk they wanted. Was fun when my sister and I would help him in school holidays and sit on the back of the ute as he would drive slowly down the streets and we would jump off to get the billy. I don’t know how he managed to lift the milk cans on to the back of the ute when they were full of milk. At the end of the day he would heat up the copper in the shed and hand wash the cans in the big tub. We had a cool room in the shed where the milk would be kept and sometimes people would come to the house to bye milk. Great memories and never heard of anyone getting sick from milk. He delivered to houses, hospital, delis and the hotel. He even did the run at Tintinara as well. My Dad delivered milk in Salisbury North in about 1954/55. Do you remember the horse that got stuck on Bagsters Road. Not sure I remember horse-drawn in the 70s but had moved from Plympton South into a new home at Reynella in 1974 and had milk delivered for quite a few years. Only ever had the money pinched twice from the front. Imagine leaving money out for deliveries these days? I think not. During the 1960s my family actually had a cow around the Fulham area but I remember the milky coming with his horse and leaving milk for us in a billy. I guess that was after the market gardens and land around were subdivided and there was no room for our cow anymore. A milky was still delivering bottled milk around Lockleys in the 1980s. I recall in the mid 1950’s at Kirton Point in Pt Lincoln people living on a steep hilly street would all hang their billy-cans on a tree branch at the bottom of the hill,to save the milky having to go up the hill. As a 15/16 year old in 1981/82 I helped on a milk run in Adelaide’s eastern suburbs on a Friday night for a couple of years there was a milk depot of large fridges and loading area, I worked on a Friday night as deliveries didn’t happen on a Saturday night so there were more bottles ordered.We weren’t allowed to start on the road before midnight… I’d run with 10 bottles in one carrier and twelve in another and then run back to the van when empty. people left their money out to pay and so this would be collected …you d run as smoothly as possible so you didn’t wake people asleep with the jingling of the coins in the leather waist bag that was worn. It wasn’t usual for girls to run all night hanging off the back of milk vans inbetween stops and we d often come across people a little ‘ under the weather’ so I’d talk in a deep voice…we delivered to a couple of shops but mainly residences and depending on how fast we ran we d be finished and home between 7:30 and 9 am. As the night wore on and you got tired the milk carriers would knock against your legs and so you d end up with bruised legs, if you were really tired and the path was un even and you were trying to run smoothly you didn’t lift your feet quite high enough you d trip, the most important thing to remember as you fell was not to try and break your fall with your hands but to throw the milk carriers away so you didn’t land on the milk bottles as they broke …..you only did that the wrong way around once…I earnt $15 for about 8 hours of running all night , and a few cartons of almost expired flavoured milk…. I felt like I was rich ! The milky was the first person in the morning I would wait patiently coming down Alexander Street, Prospect back in the late 50’s. When he’d get to our house, it was the start of the love of horses, he would pop me on top of his horse, little legs splayed out and holding tight to the horses collar where I’d get off at the corner tuck shop. And so it went on, the only change was that some times I had to take a small bottle of cream. It had to be fast, more so in summer, milk curdles, but in winter it ,some time froze. OH what fun, I was 8 yrs. In 1977 I did a milk run with a cricket clubmate in Cumberland Park for a few weeks while the boss had a holiday. I loved the feeling of being up and doing something while everyone else was asleep (we started at the mandatory hour of midnight and went through till about 5). As well as milk, we delivered yoghurt and cream and orange juice. Towards the end of the run a gentle old Labrador would tag along with us, waiting for his reward as we finished up – a small carton of milk, opened out so that he could slurp and lick it up – hence his nickname “Licky”. I was surprised to witness milk being delivered by a horse drawn cart in Beverley in late 1977. I remember being amazed as the horse would keep pace with the milkman as he ran along the street delivering milk to each house. The horse would stop every few houses, the milkman would run to the cart and pick up more bottles and the horse would walk forward again. The milkman wasn’t instructing the horse, it just knew what to do and it looked like a very efficient operation. When you think about animal/human working partnerships it’s always the animal that does the hard yards. In this case, it was the other way round, the milko ran the whole route while his horse took it in a very leisurely manner indeed. This strikes me now as a truly ironic and fitting way to close out the working horse era. Does anybody know if this was the last of the horse and cart milkos operating in Adelaide? Or Australia?